PDF-XChange Lite is the lite and simplified version of Tracker-Software’s best-selling virtual printer, PDF-XChange Standard. It installs in the same manner as a standard printer and can be selected as desired to print/convert documents into industry-standard PDFs. Almost all windows applications are compatible with this software. It uses the same cutting-edge PDF creation engine as all of the Tracker Software applications. PDF-XChange Lite is ideal for home users, small businesses and all who require a simple and efficient method to create PDF files. It creates files that combine optimized space usage and excellent image quality. PDF-XChange Lite is free for non-commercial use. Additionally, it is no longer available as an individual product, but it is included with two of our other applications – PDF-XChange Editor/Editor Plus and PDF-Tools. (Please note that existing owners of PDF-XChange Lite will continue to receive free updates to new version releases with active product maintenance). PDF-XChange Lite has been re-engineered and now features a faster, highly optimized hybrid conversion engine that prints to both GDI and XPS. Driver Mode Rules have also been introduced, which enable the designation of GDI/XPS printing for user-specified printing applications. Create PDF files from the output of almost all Windows applications. Adjust paper size, scaling, basic graphic resolution and layout options. Create custom forms to use when printing to PDF. Utilize Font Embedding Options to optimize the size of printed files. Insert additional information and/or metadata when files are converted. Use advanced save settings to save files, strip paths from document names, add macros and run applications automatically after documents are printed. PDF-XChange Lite is Citrix Metaframe/Terminal Server certified. Use the PDF-XChange Lite language pack to update the UI to your language of choice. All Windows versions from Windows XP are supported. Please note that there are some limitations to Windows XP support, as detailed here. Resolution output up to 2400 DPI. Mixed Raster Content (MRC) support. TWAIN 32-bit scanners supported in 64-bit environments. Improved conversion of images and image-based text characters. 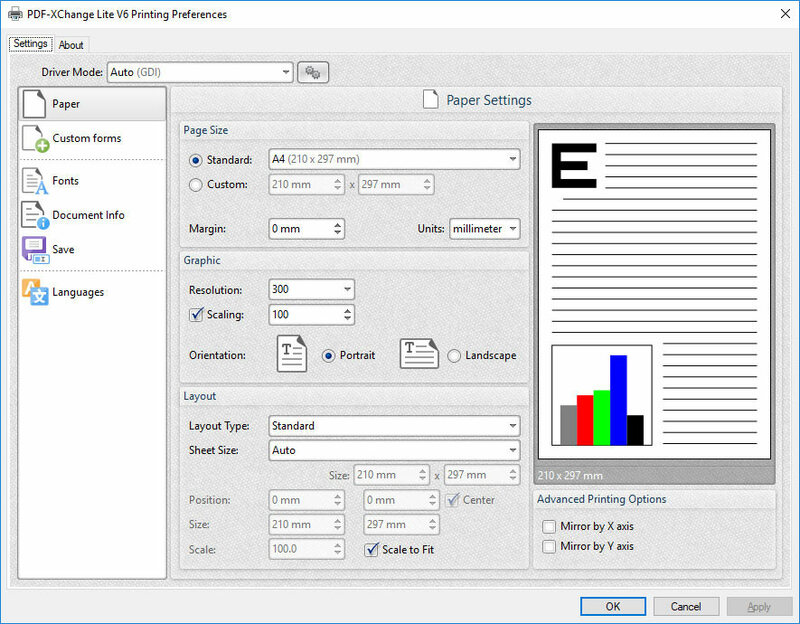 PDF-XChange Lite enables users to control basic paper settings such as scaling, resolution, layout (for example n-up and booklet setups) and manage embedded font data. Tracker Software make the evaluation versions of their products freely available for unrestricted private and commercial use - provided that they are not bundled with other software for financial gain. All licensed features of our products can still be used in the evaluation versions, but watermarks will be added to output content, as detailed below. If you decide to purchase the product then all content subsequently created will be free of the evaluation watermarks. Additionally, we guarantee that none of our evaluation products require registration, and neither do they contain Spyware, Adware or any other invasive content. Furthermore, all of our products are very simple to fully uninstall via the the 'Add/Remove Software' option of the Windows Control Panel. PDF-XChange Lite is available in an 32/64 bit .EXE installer only. Best of PDF-Editors ... Ich bin Software-Trainer in Hamburg (www.d-lan.eu) und liefere PDF unter anderem als Unterrichtsbegleitmaterial aus. Ich bin Software-Trainer in Hamburg (www.dlsos.de) und liefere PDF unter anderem als Unterrichtsbegleitmaterial aus. Mit diesem Tool produziere ich schnell, gut und kostengünstig. Außerdem empfehle ich den Editor für Büroumgebungen. Excellent product! I enjoy to use it. Can recommend everyone who needs lightweight and smart soft to get pdf-documents. This is great software. It's good not only because of its performance in terms of size and speed, it's also excellent because of its humane design, friendliness, and offer. You will know what I mean after giving yourself an opportunity to try it.